During President Barack Obama's meeting with U.S. governors at the White House Monday, the president dismissed members of the press to hold a private, hourlong discussion with the visiting state executives. Whatever was said after the cameras left the room especially incensed South Carolina Republican Gov. Nikki Haley. 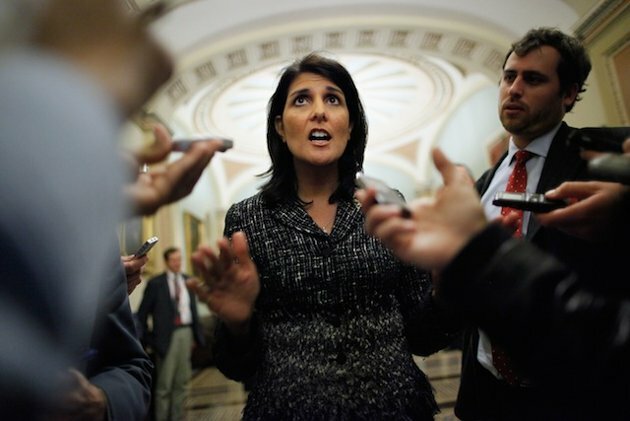 "I could not be more frustrated than I am right now," Haley told reporters after the meeting. She said that when she asked Obama if he would consider a last-minute plan to shave about 2 percent from the annual federal budget without increasing taxes, the answer was "no." "My kids could go and find $83 billion out of a $4 trillion budget," Haley said. "This is not rocket science." Meanwhile, Michelle Obama poses before a military contingent, and preens for the fops and dandies at the Oscars. Why do I have the feeling that no matter what happens, the Obamas - and the political class - will be immune from the effects (no matter how great or small) of the sequestration?